madly off in all directions: Damn You X-Files! As I indulged in a few more episodes today while knitting the Lotus Blossom, I set my knitting down on the ottoman for a moment to grab a glass of water. When I returned I pressed "play" and knocked my knitting to the floor (that's not a big deal). I reached down to grab the two ends of the circular needle while paying attention to the plot, and by mistake had hold of only one end of the needle. Zzzziiiiip. Off fell my stitches. 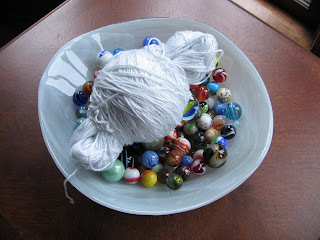 I tried to pick them up, but the bamboo yarn is so smooth and silky it just unravelled further and further. that's it posing with my marbles. LIBRA - This is a mildly accident-prone day, so keep your eyes open. Don't be hasty in your actions or your speech. Whatever trips you up will be minor. In good news, I finished that first sock last night. Oh No!!! How could anyone laugh at this? It's a disaster. I hope you're going to try again - I love the Lotus Blossom! Sending you much sympathy. Good Job on the sock!! Hmmm...I strongly suspect that Nelson Muntz and Mrs. Krabappel were signed on through your account Nigel.